Efficient anion recognition is of great significance for radioactive pertechnetate decontamination, but it remains a challenge for traditional sorbents. Herein, we put forward a tactic using soft crystalline cationic material with anion-adaptive dynamics for pertechnetate sequestration. As a troublesome nuclear waste component and potent radioactive pollution source, complex chemical behavior of 99Tc hampers separation of uranium and plutonium during reprocessing of spent nuclear fuel, and high volatility of 99Tc species (Tc2O7) constrains incorporation into glass waste forms via high-temperature vitrification. Meanwhile, 99Tc, as stable TcO4- in its dominant +7 oxidation state, is highly water soluble and can migrate readily in the environment, thereby posing severe environmental risks. 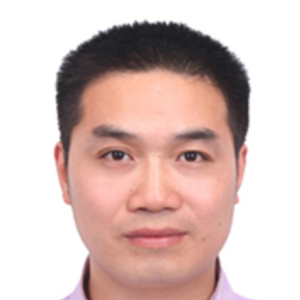 Therefore, efficient capture of radioactive 99Tc has received considerable attention for both nuclear waste management and contaminant remediation purposes. Solvent extraction and ion exchange are two well-established effective methods for removal of TcO4- from aqueous media, the former of which can achieve high selectivity, but practical applications are limited by cost and inefficiency, while the latter using traditional polymeric materials or inorganic cationic materials such as layered double hydroxide (LDH), sulfides, and borates always suffer from slow anion exchange kinetics, low sorption capacity or poor selectivity. Efficient anion recognition is important for radioactive 99TcO4-decontamination, but how to achieve selective anion recognition remains a problem. A rational approach for improving selectivity of solid sorbents is to endow sorbent materials ideal ion-recognition capability. Herein, inspired by molecular recognition of anion receptors, we put forward an alternative tactic that circumvents this drawback via an easily prepared anion-adaptive sorbent material that can behave like an anion receptor itself. Conceptually, this soft sorbent material is capable of dynamically tuning structural arrangement of its framework in response to different anions, enabling attainment of an optimized pore size and shape match for maximum interactions with, and resulting selectivity for target anions such as TcO4-. 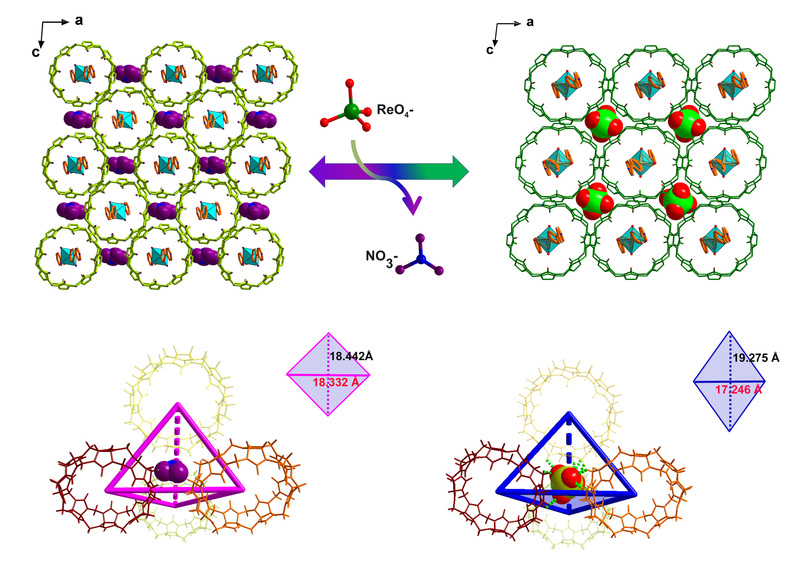 A cucurbituril (CB8)-based cationic supramolecular metal-organic framework, SCP-IHEP-1 ([Cu((bpy)2@CB8)(H2O)4](NO3)2·18H2O), was constructed by a multi-component supramolecular collaborative assembly. The CB8 macrocycle used here plays a vital role in accomplishing both the construction of supramolecular network and anion recognition. As expected, this material is demonstrated to be an efficient and selective sorbent capable of reversibly sequestrating TcO4-/ReO4-. Single crystal structure analysis of ReO4- (a non-radioactive surrogate of 99TcO4-)-incorporated after anion exchange experiment reveals the mechanism of its selective recognition of TcO4-/ReO4-, that is, the supramolecular framework performs adaptive reconstruction of the supramolecular skeleton after anion exchange, thereby promoting TcO4-/ReO4- effective identification and separation. The anion-adaptive capability of this supramolecular sorbent towards effective TcO4- recognition resembles the dynamic behavior of the receptor during ion recognition, and can be taken as a representative TcO4--specific smart sorbent material. This work shows that, as a new class of anion-adaptive cationic materials with structural dynamics inspired by anionic receptors, the supramolecular material exhibit excellent removal performance of TcO4- (and ReO4-), especially in selectivity against competing anions. Given the mechanism for selective TcO4- uptake involving anion-adaptive rearrangement of hydrophobic pores, we expect that the tactic put forward here paves a way for subsequent development of radioactive decontamination materials based on anion recognition. The paper in Nature Communications is here: https://www.nature.com/articles/s41467-019-09504-3.